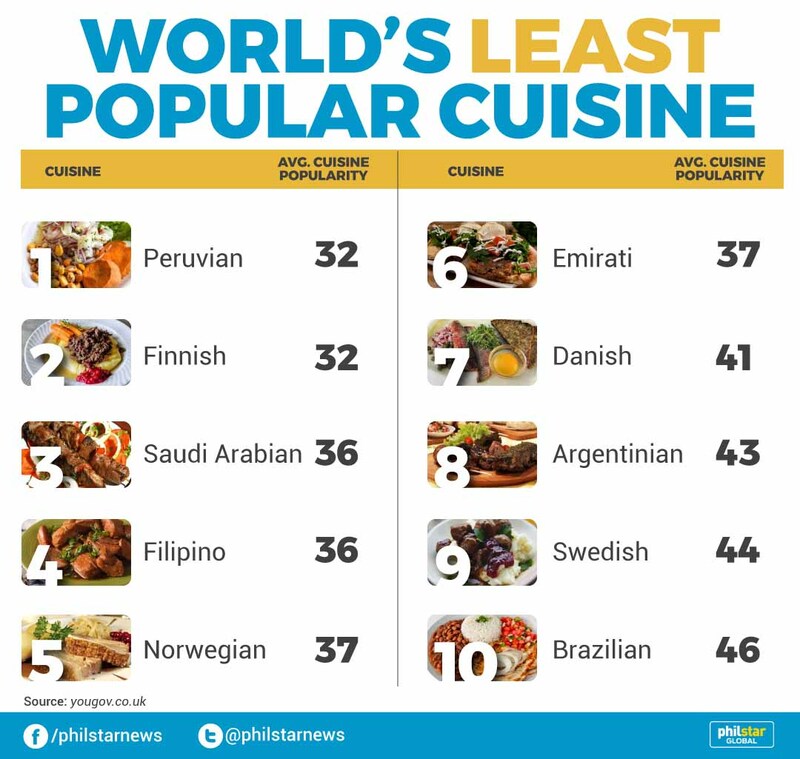 MANILA, Philippines — While Filipinos are the most likely to appreciate food from other cultures, the country’s own cuisine is one of the least popular in the world, according to a study by a United Kingdom-based data analytics firm. YouGov’s study, which asked over 25,000 participants in 24 countries, found that only 36 percent of the respondents said they like Filipino food. It is one of the second least popular cuisines along with Saudi Arabian food. Ninety-seven percent of the Filipinos surveyed said they enjoyed their own cuisine. At the bottom of the list were Finnish and Peruvian cuisines, scoring an average of 32 percent. Italian food, on the other hand, is the most well-liked cuisine across the globe after garnering a score of 84 percent across all the countries surveyed. Chinese food placed second with 78 percent and Japanese food came in third with 71 percent. 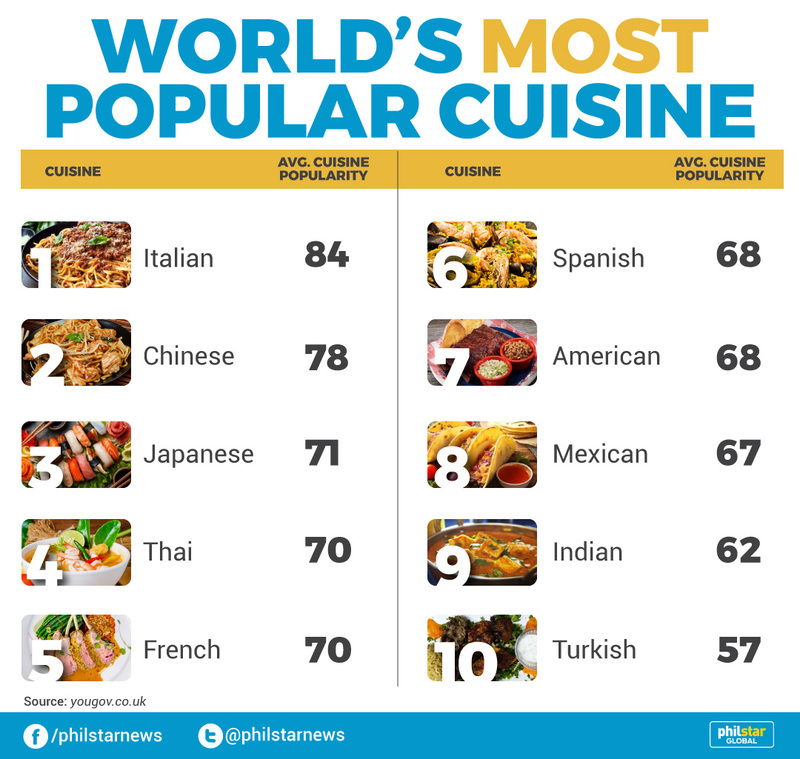 The world’s most popular cuisines also included Thai (70 percent), French (70 percent), Spanish (68 percent), American (68 percent), Mexican (67 percent), Indian (62 percent) and Turkish (57 percent). YouGov’s study asked the respondents on which of the 34 national cuisines they had tried and whether they liked or disliked them. Another finding of the study revealed that Filipinos were the most likely to enjoy food from other countries. “An average of 67 percent of Filipinos who had tried any given cuisine said they liked it, with only five types of food being liked by fewer than half,” the report said. It also found that Japanese are the “harshest” food critics among the nationalities surveyed. On average, only 39 percent of Japanese people who had tried foreign food said that they liked it.